Renowned entomologist Dr. Donald Lewis McLean of Paradise, Calif., a longtime UC Davis faculty member and administrator, died March 29. He was 85. Affiliated with the University of California since 1955, he joined the UC Davis faculty in 1958, retiring in 1987. He chaired the UC Davis Department of Entomology from 1974 to 1979 and served as dean of the Division of Biological Sciences from 1979 to 1986 and then accepted a position as dean of the College of Agriculture and Life Sciences at the University of Vermont, an administrator for five years. Dr. McLean served as president of the Entomological Society of America in 1984, the first UC Davis entomologist to do so. 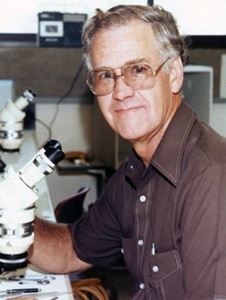 He was selected a fellow of ESA in 1990, a fellow of the American Association for the Advancement of Science in 1993; an honorary member of ESA in 1992; and ESA secretary-treasurer in 1985. His research interests included insect transmission of plant pathogens, vector and pathogen interactions related to acquisition and transmission, development and utilization of electronic monitoring systems to study insect feeding and salivation relating to pathogen acquisition and transmission, virus and bacteria microbiology, aphid symbiote biology and biochemistry, animal and plant ecology. He published his peer-reviewed work on aphid salvation and ingestion, bean yellow mosaic virus, Pierce's disease bacterium and pea aphid symbiont relationships in a number of journals. He received his bachelor's degree from Tufts University, Medford, Mass. ; his master's degree in entomology in 1955 from the University of Massachusetts, Amherst;and his doctorate in entomology in 1958 from UC Berkeley. Born Oct. 2, 1928 to parents Lewis and Bertha McLean outside Boston, Mass. , he grew up in Walpole, Mass. He married Joanne Hatch in 1952 in Walpole. He is survived by his widow, Joanne; three children: Scott (Anne), Cheryl (Tim), Joyce (Steve); six grandchildren; and six great grandchildren. He was an outdoorsman who enjoyed camping with his family, backpacking, and playing many sports throughout his life. He was an avid Red Sox Fan, fisherman and photographer. A memorial service took place April 11 at the Rose Chapel, Paradise on Friday, April 11, 2014. The family asked that in lieu of flowers that donations be sent to the Wounded Warrior Project and Hospice House of Paradise. "I remember Don for many things, but two really stand out in my mind. When I first arrived at UC Davis in late 1978, one of the first things Don told me was that I was only his second female grad student, and that the first one did not do well. He didn't express much hope that I would do better. I, however, took it as a challenge. Five years later, he told me that he had been wrong in his early judgment, and that my lab mate, Diane Ullman, and I had proven that to him by the high quality of our work. By 1984, Don had become so convinced of the value of women to our field that he made improving minority representation in entomology as the major theme of his year as president of ESA. I was grateful for his open-mindedness, willingness to change his mind, and determination to help our society enact that change. "The second thing I will always remember about Don is his (and Marv Kinsey's) inspired idea to invent a technology now called electropenetrography (EPG). The spark of genius that started in their lab has literally founded a whole new science. EPG has become (what is roundly considered by hemipterologists and vector researchers worldwide as) THE go-to method for the study of piercing-sucking feeding by hemipterans and other insects. Virtually all of what is presently known about mechanisms of aphid transmission of plant viruses is due (at least in part) to EPG. For 30+ years, EPG has been the centerpiece of my own research program. Yet, the only electronics class I ever took was Don's 'Electronics in Agriculture' course! I am humbly grateful for the many years of joy and fascination their invention has brought to myself and many friends and colleagues around the world. Don McLean's career had a real impact on our field, more so than even he realized."